Sharing a manufacturer’s catalog with their distributors has never been easier! Build an online relationship and save money. Stop printing thousands of catalog’s that are quickly outdated. Learn more about our Distributor Support Solution and increase the speed to market of your next product! Our distributor support solution builds a master website with an industrial website design. The master website then provides the manufacturer the ability to share product information with participating distributors. This solution, in essence, provides a copy of the manufacturer’s product information on the distributor’s website. Each participating distributor will be provided the specific product information they carry, they can have the whole catalog or access to individual products. The manufacturer controls the content accuracy as they update their products. The distributors copy can be a standalone website or customized to look like their current website in overall design. This solution enables the distributor to have all of the product specs and enough information that the end user won’t leave the site to learn more. All inquiries from this solution will go to the distributor. The distributor can control the RFQ format and prices presented on their copy of the website and have the ability to provide private pricing to their customers. The distributor support solution also provides the capabilities to share product configurators or part number builders that an OEM may have on their website. Again, if the distributor is interested in these custom requests, they can have access to the product configurator and generate more custom RFQ or ecommerce leads. Ecreativeworks’ Distributor Support helps build the manufacturer and distributor’s online relationship. With a distributor support solution the middle man is eliminated and more leads can be generated. Syndicate online catalog for use on distributor sites. Improve your products’ "speed to market". Control which products distributors show on their websites. Offer a product configurator that distributors can use on their site. Sell more by simplifying the manufacturer/distributor relationship. Access manufacturers` complete online catalog content. Maintain existing industrial website design. Address online purchasing and RFQ templates. Ecreativeworks can customize web applications to meet the needs of our customers. In our Distributor Support Solution manufacturers are able to offer private catalogs with custom pricing and password-protected log-ins to key distributors. In addition, they can customize part numbers and product pricing to match their internal ordering system. 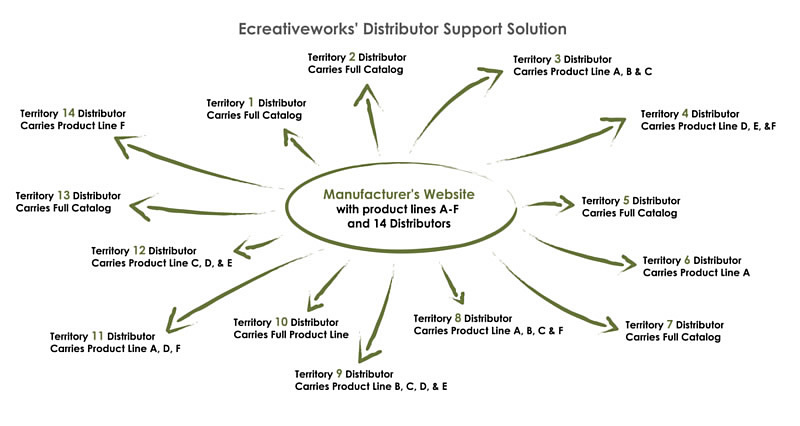 To find out more on how Ecreativeworks Distributor Support Solution can help your company build an online relationship with distributors or if you are a distributor and want to have your manufacturers take part in this solution, call or contact us today!